Hey you, advertising people! Just in case you have been missing news concerning our Display Advertising, we’ve made some improvements, so that you can profit more from working with the tool. Let’s get down to details. If you have a business subscription plan, you’ll be able to appreciate the convenience of our new Period filter which will allow you to view data for the last 7, 15, 30, or 90 days. Our next step will be to embed the advanced version of this filter, showing any specific time period of your choice. Stay tuned! 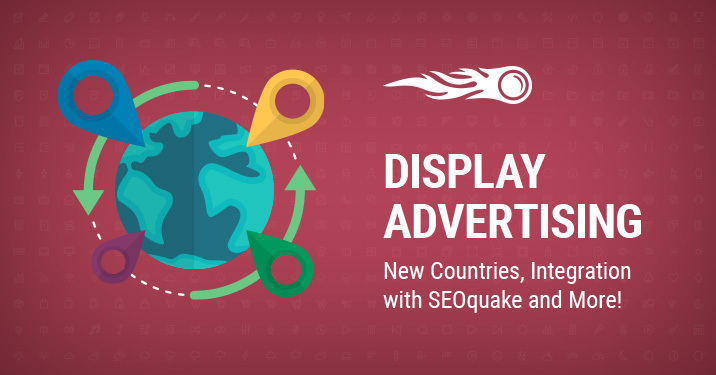 Good news for all our SEOquake users. DA data for publishers and advertisers can now be viewed on Google SERP pages while using the SEOquake extension – easily and conveniently! Since SEMrush has a number of tools for specialists who deal with paid advertising campaigns, we came up with the idea to bring together some related data for your convenience. Now you can check whether your domain has media, HTML, or text display ads right within the Advertising Research report. Clicking on this data will immediately take you to the appropriate detailed reports in DA. A similar update was implemented in the Overview Mobile report. Now while checking your domain summary data for mobile devices, you’ll be also able to see information on display ads broken down by type of device. The data is also clickable. That's all for today, and we hope you like these updates. We’re improving our services according to your comments and suggestions, so keep them coming to [email protected]. Your contribution is always much appreciated.